Del Webb at Rancho Mirage real estate includes Spanish and Tuscan inspired, detached single-story homes, built on fee simple land, which means homeowners own their own lot rather than leasing it, like many other active adult communities. Homebuyers can choose from 10 different floor plans, ranging in size from 1,438 – 2,726 Sq.ft., with 2 – 3 bedrooms, 2 – 3.5 bathrooms, a 2 -3 car garage, and a vast array of customizable options so homes can be tailored to the unique tastes, needs, and lifestyle of each homebuyer. Design features such as spacious kitchens and adjoining gathering rooms are perfect for entertaining family and friends along with private owner’s suites provide ample rest and relaxation. Del Webb refers to these homes as “consumer-inspired,” as home design features are based on what the active adult homebuyer has told them what they want in a new home. 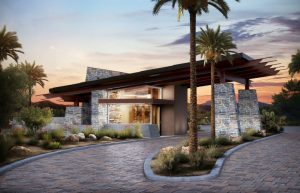 Currently, Del Webb at Rancho Mirage homes for sale are priced starting from $366,990 – $563,990. Del Webb at Rancho Mirage features an impressive selection of resort-style amenities for an active lifestyle! Although the premier community does not include a golf course, homeowners who enjoy playing golf have their pick of more than 200 courses in the area. Amenities include a clubhouse/activities center, a ballroom, a fitness complex, an aerobics studio, a billiards room, meeting rooms, a library, resort-style swimming pool, tennis and pickleball courts, hiking and walking trails, and much more. In addition, those who decide to purchase one of the beautiful Del Webb at Rancho Mirage homes for sale have the opportunity to enjoy a wide range of clubs and interest groups, providing endless opportunities to learn, be creative, share ideas, and make lifelong friends. Del Webb at Rancho Mirage real estate is conveniently located within minutes of the I-10 freeway, excellent shopping, dining, and entertainment destinations, and medical facilities like the Eisenhower Medical Center. The Palm Springs International Airport is within a 20-minute drive. With over 24 years of real estate experience, Elaine Stewart offers a wealth of local market knowledge and expertise. Elaine truly enjoys helping her clients with the process of buying or selling a home in the Coachella Valley. As a licensed, professional REALTOR®, Elaine is committed to providing her clients with accurate, reliable and trustworthy information and the exemplary, personalized service they deserve.